Cakes have always been our favourites. To bake pretty cakes do not require exemplary skills. Strawberry Mousse cake is one such easy to make, but a very pretty cake. You could prepare this in a day or two prior of the party and demould the cake on the event day which saves time and reduces your stress. I have prepared here vanilla sponge cake as a base as per my taste. You could use chocolate sponge cake base or biscuit base too if you wish. If you have few strawberries you could skip the jelly as well; as the strawberries kept on the rim of the cake could very easily replace the jelly and make it a simple yet elegant cake. I have earlier shared Chocolate Mousse Cake recipe without gelatin or china grass. * Do not add baking soda if you you are using Self raising flour. Crack the eggs and beat well using a electric beater or whisk. If you are making eggless version use yogurt instead of eggs. Add the sugar and beat well till creamy. Now add the oil and beat well until it becomes frothy. Add the vanilla essence, milk and beat well to combine. Now shift/sieve the all purpose flour, baking powder and baking soda together to evenly mix well. Add this dry ingredients 1/4 cup at a time and mix well. Once you finish adding the whole lot mix well. Grease a pan and dust with flour or cover the base of the pan with wax paper. Pour the batter on the pan (18-20 cm) and flatten the top. Preheat the oven to 180 degrees for 10 minutes and bake the cake for 20-25 minutes until the skewer inserted comes our clean. Allow the cake to cool down thoroughly. Using a serrated knife cut the cake in to equal halves. To prepare the mousse chill the bowl, whisk and cream. Pour the cream on the chilled bowl and beat well using a electric beater or normal whisk until creamy. Now add two tablespoons of sugar and beat well till soft peaks starts to appear set aside. To make the strawberry puree remove the stem and leaves deep down and wash and roughly chop the strawberries. Keep them inside a blender jar and finely puree them. Strain the pulp using a strainer to remove the seeds and add the pulp inside a pan. Add the gelatin and allow to soak for five minutes. Now add the sugar and cook until the gelatin and sugar get dissolved. From this syrup reserve 1/4 portion to set the jelly on top of the cake. Take the remaining 3/4 portion of gelatin added strawberry syrup in a bowl and add the the whipped cream one scoop at a time and beat well. Once you add the whole lot beat slightly to mix uniformly. If you over whip the cream it start to thicken as gelatin is there in the mixture. Make sure the whipped cream is not so cold as it forms lumps on the mousse. Take one half of the sponge cake and insert it on a same sized spring foam tin/ cake ring. Cut the strawberries and arrange them in a way that the cut ends facing the tin. You could use thick slices like me if you use thin slices when you lift the pan chances are there the strawberries could slightly slide down. Pour the prepared mousse on top of the sponge cake and flatten the surface and refrigerate for 3-4 hours or overnight. Pour the jelly mixture kept aside on top of the set strawberry mousse. Refrigerate and allow to set the jelly for an hour. Dip the kitchen towl in warm water and wrap the towl on the sides of the cake tin for a minute. Now open the spring pan and cut the cake in to slices and serve. Strawberry cheesecake looks splendid dear..very beautifully made. 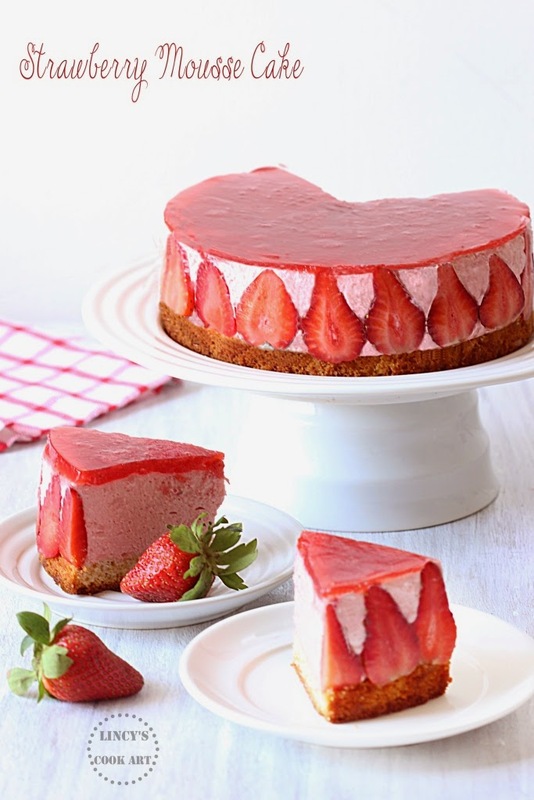 strawberry mousse cake looks awesome. It definitely looks so pretty... I seriously wish I was your neighbour!!! This fraisier is perfect! And you make it look so easy too. What inch pan did u use for this? How many grams or ounces strawberries for the Puree?